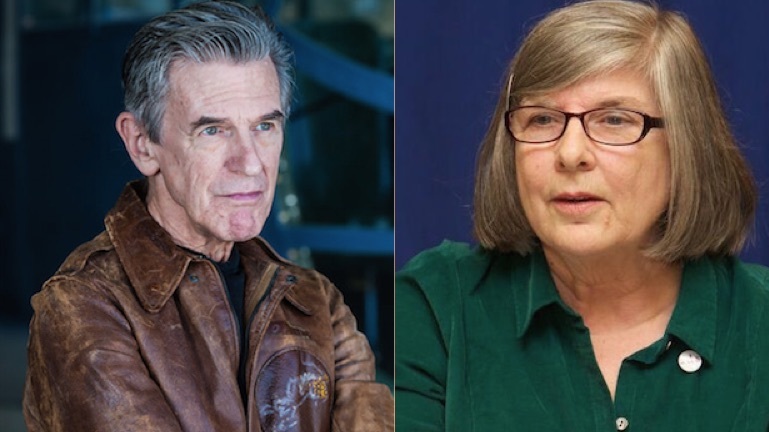 This all-star array of guests includes a populist icon, Vietnam vets reflecting on the war, a climate change scholar, a founder of the Weather Underground, and legendary Austin musicians performing live. 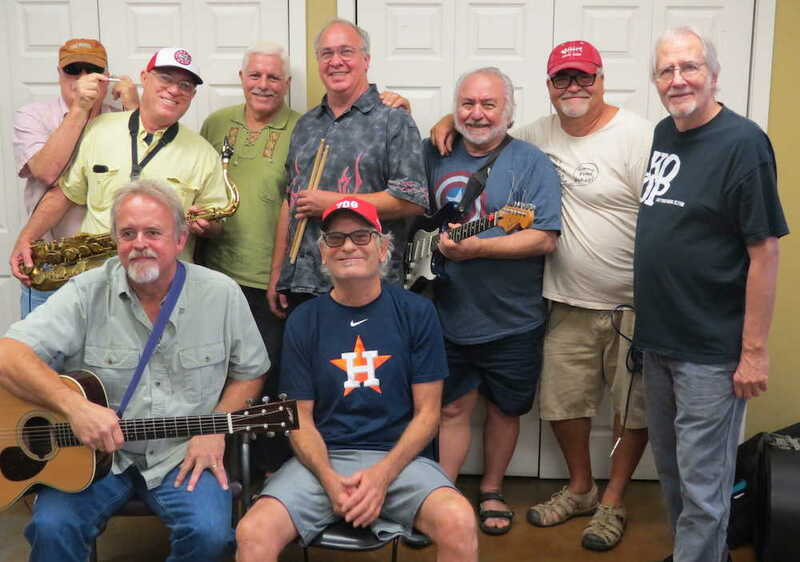 Kerry Awn, center in Astros cap, and the historic Austin band, the Uranium Savages, in the KOOP studios, Sept. 1, 2017. 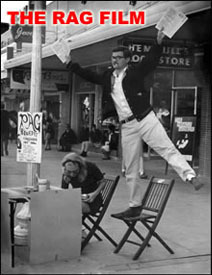 Host Dreyer hovers at the right. Photo by Roger Baker / The Rag Blog. 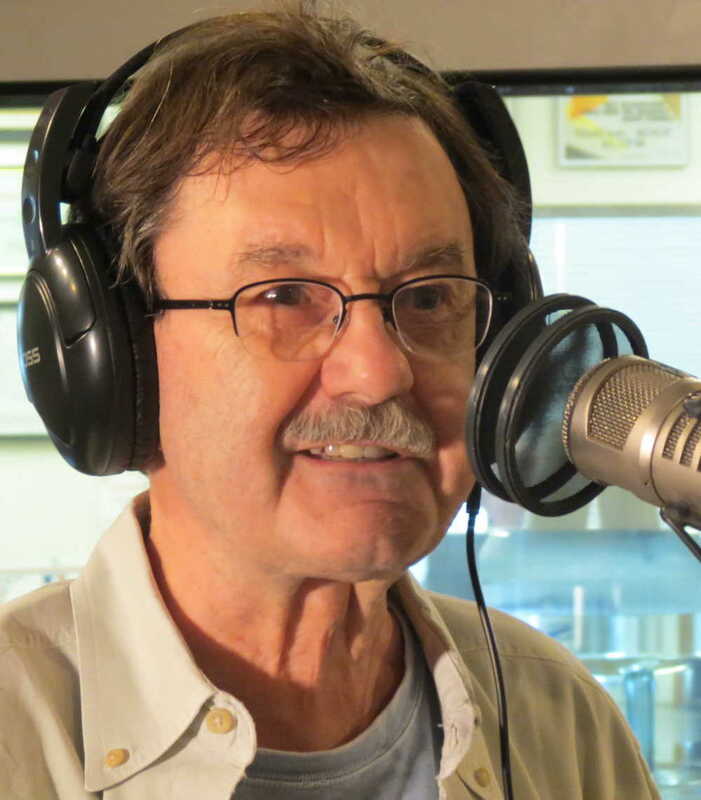 The following podcasts are from recent Rag Radio shows with host Thorne Dreyer. 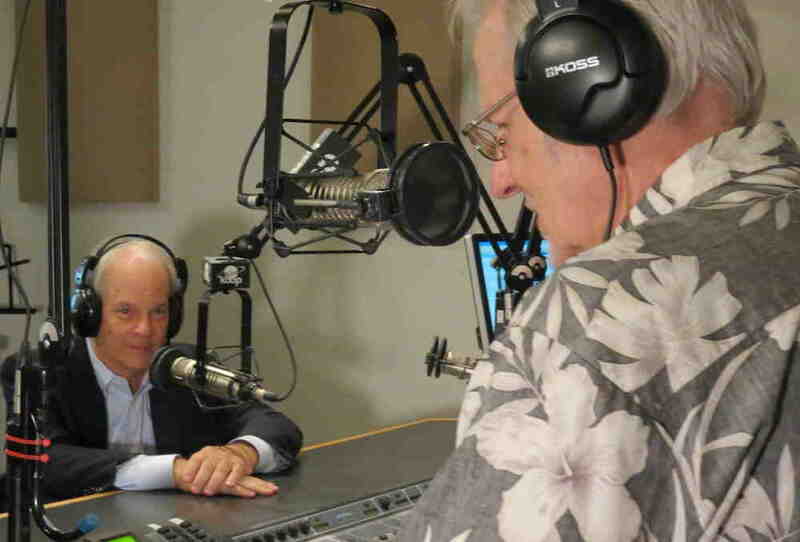 The syndicated Rag Radio program, produced in the studios of Austin’s cooperatively-run KOOP-FM, has an international audience and has become an influential platform for interviews with leading figures in politics, current events, literature, and cutting-edge culture. 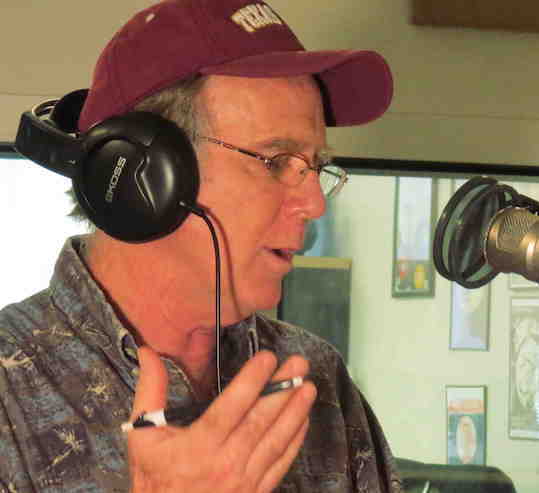 The show first airs Fridays, 2-3 p.m. (CT) on KOOP, 91.7-FM in Austin, and streams here: http://www.koop.org/listen-now, and here: http://www.radiofreeamerica.com/show/rag-radio-koop-radio. 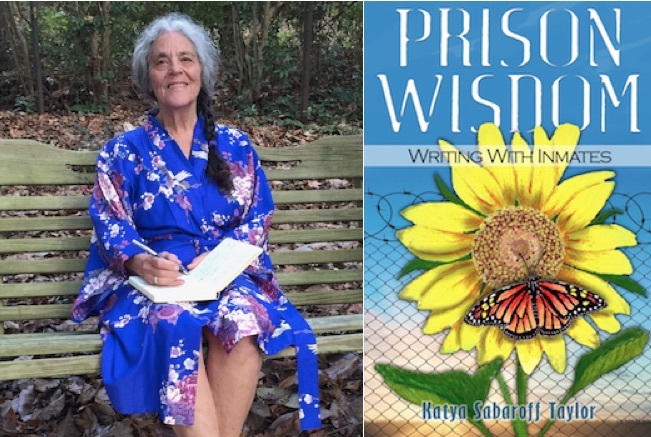 Thorne Dreyer’s guest on Rag Radio is Katya Sabaroff Taylor, editor of Prison Wisdom: Writing with Inmates, an impressive collection of writing by prisoners she taught, with some writing of her own mixed in. Dreyer and Nina Sabaroff, then a radical journalist, were colleagues at Liberation News Service (LNS) in New York City in 1968. She became a healer: a massage therapist, a yoga instructor, and then a longtime writing teacher who gave workshops in prisons and helped inmates express themselves in words and in images. 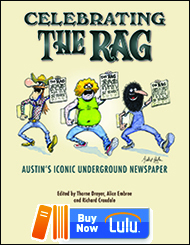 Rag Radio features UT-Austin journalism professor, Dr. Maggie Rivas-Rodriguez, and poet, playwright, and critic Gregg Barrios. 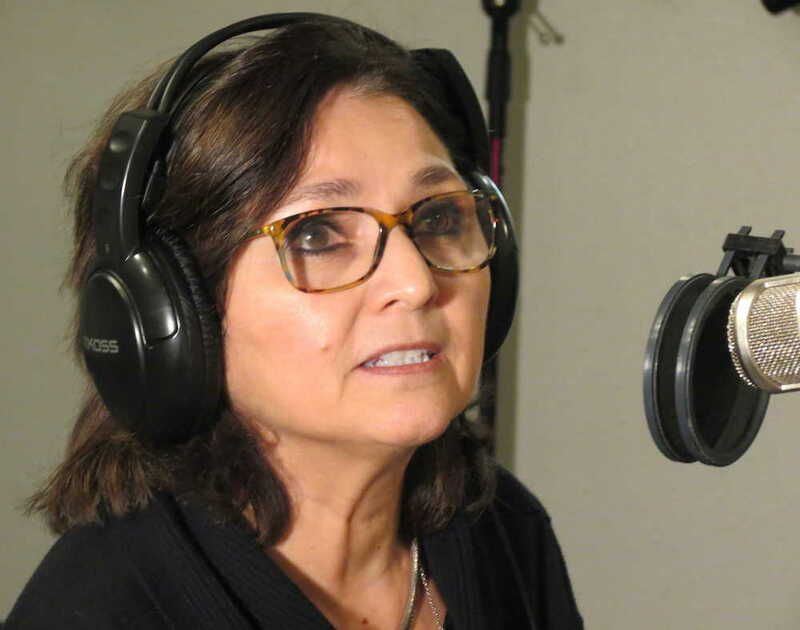 They discuss with host Thorne Dreyer the important role played by Latinos and Latinas in history — and how their accomplishments are often ignored or given short shrift. In 2007, Latinos (and others) throughout the country protested Ken Burns’ 14½-hour documentary, World War II, The War, that included no Latino voices. A nine-person Veterans for Peace delegation visited Palestine/Israel earlier this year. They met with Palestinian popular resistance leaders as well as members of the Knesset. They participated in nonviolent direct action and witnessed the resiliency, solidarity, creativity, and courage of the Palestinian resistance to the Israeli occupation and the settlements that steal their land, water, and other resources. Joining host Thorne Dreyer are photographer Ellen Davidson, former State Department official and USMC Capt. Matthew Hoh, former U.S. Army paratrooper Tarak Kauff, and filmmaker Chris Smiley. 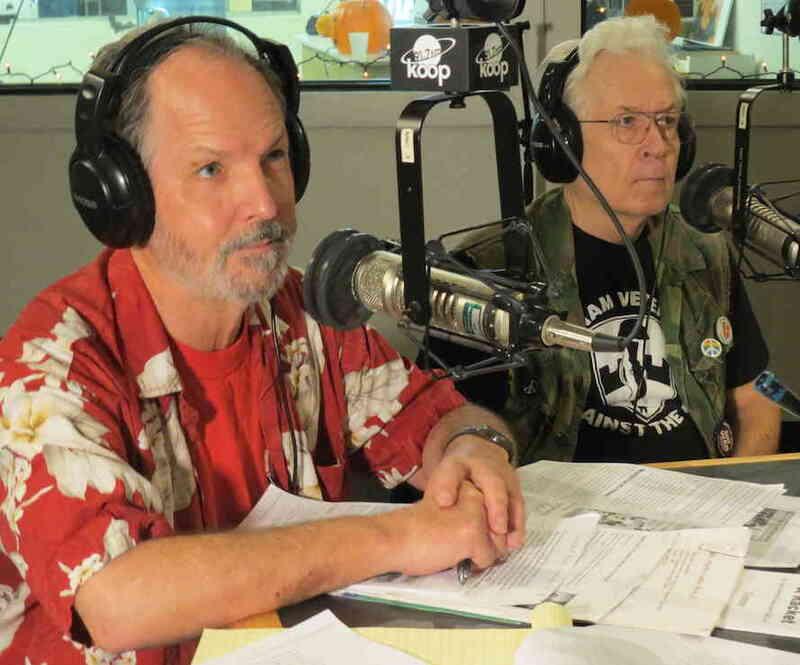 Terry DuBose and Alan Pogue — who, upon returning from serving in Vietnam, organized GIs and Vietnam vets in opposition to the war — are Thorne Dreyer’s guests. They use the Ken Burns documentary as a taking-off point to discuss the war and its place in our history, including subjects that the Burns film, with its attachment to false equivalence, either omits entirely or gets very wrong. 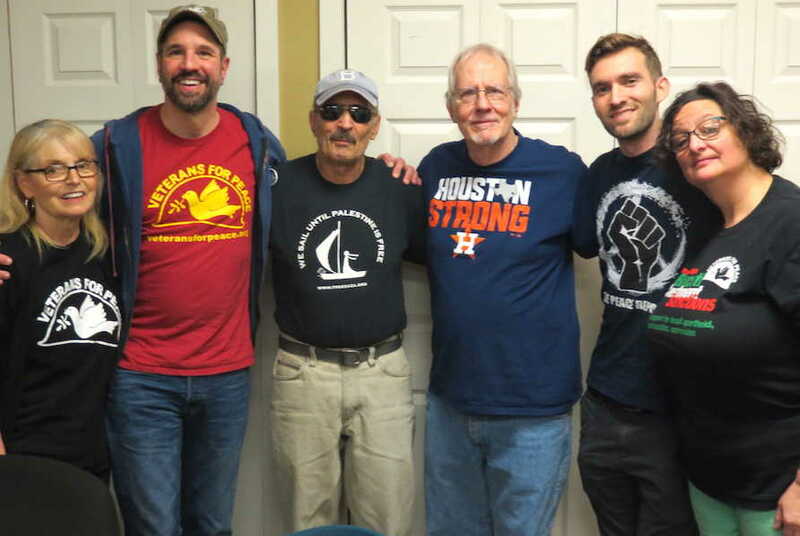 Terry founded VVAW in Austin and was active nationally, and Alan, a renowned documentary photographer, was active with Veterans For Peace, SDS, and Austin’s underground newspaper, The Rag. 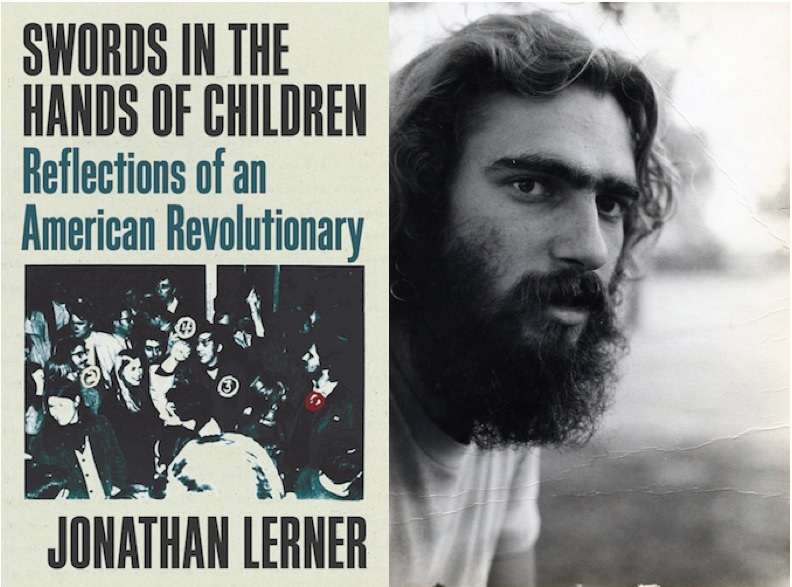 Thorne Dreyer’s guest is Jonathan Lerner, author of Swords in the Hands of Children: Reflections of an American Revolutionary. Jonathan is a veteran of SDS in the late Sixties and was a founder of the Weather Underground. He offers a critical reflection on the militant group that bombed buildings across the country, including the Pentagon, the U.S. Capitol Building, and the U.S, State Department. His memoir also deals with the difficult reality of his life as a closeted gay man working within a very macho group. Jim Hightower, America’s best-known populist writer, author, and radio commentator — and progressive political activist — joins Thorne Dreyer this week. We address the top of the political news — including Trump’s bizarre political acrobatics — with homespun humor. We look at the prospects for progressive candidates in upcoming elections. We talk about the hypocrisy of Ted Cruz, who voted against aid for Hurricane Sandy and now is demanding aid for Hurricane Harvey victims, and we’ll visit some Wall Street thieves and Trump’s Wall. Thorne Dreyer is joined by artist, comedian, and musician (and former “Funniest Person in Austin”) Kerry Awn — with the Uranium Savages, the historic Austin band that mixes in satirical and slapstick performance art with its rock ‘n roll. Leader (and lead singer) Kerry and the band (eight-strong) perform several songs live and tell great stories about the early days of the Savages (more than one tale involving the police!) 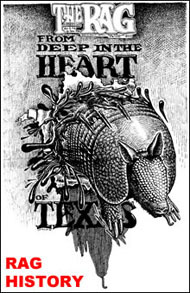 and the Austin music scene in the ’70s and beyond. This interview with climate change researcher and activist Bruce Melton was first broadcast as Hurricane Harvey was approaching landfall. On the show, Melton discusses with host Thorne Dreyer the past, present, and future of hurricanes — in the context of global warming. 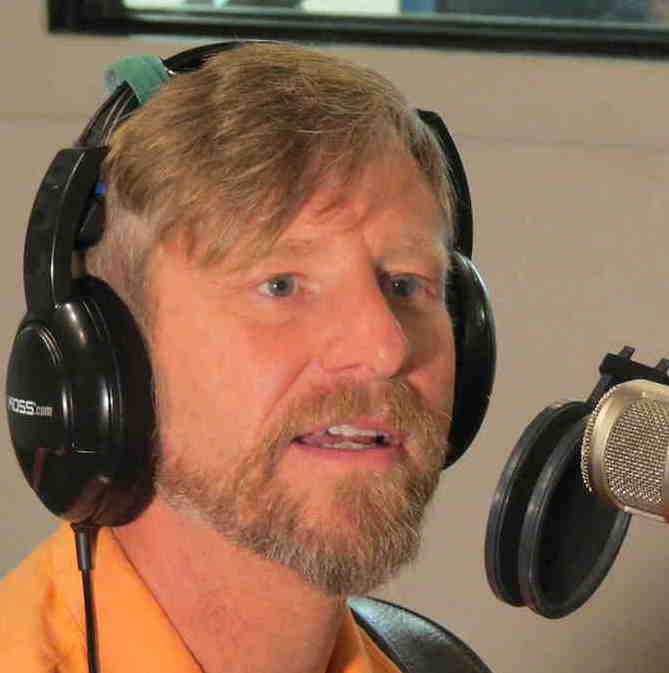 Bruce Melton is a professional engineer, environmental researcher, filmmaker, author, and director of the Austin nonprofit, the Climate Change Now Initiative. Founded in 2005, the Initiative is the oldest independent climate science education organization in the world. Noted Democratic strategist and Rag Radio political analyst Glenn Smith once again joins host Thorne Dreyer to take on the political horror show — from our president’s enabling bromance with Nazis and Klansmen — to the parallel craziness of the Texas legislature, where ultracon Gov. Abbott has been engaged in a duel-to-the-death with moderate House Speaker Joe Straus over who can go to the bathroom and how to manhandle the state’s cities that have gone astray. 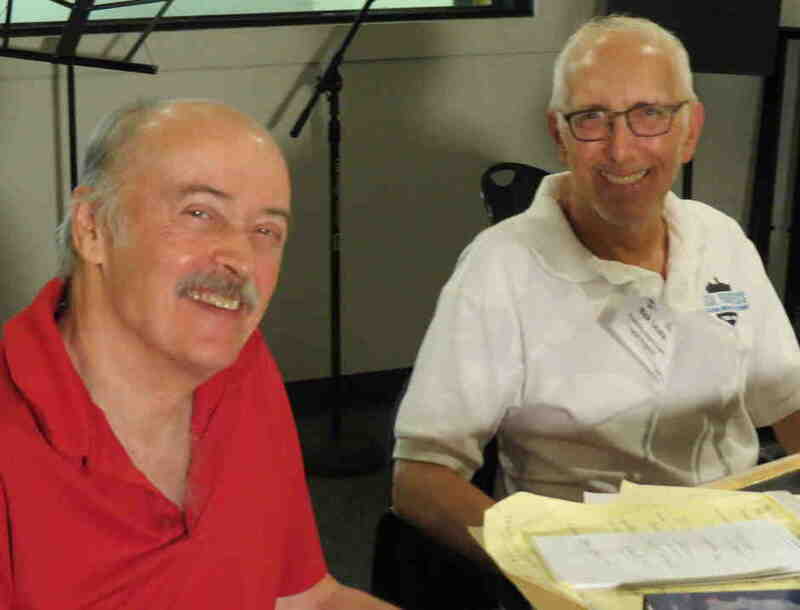 Steve Early and Nick Licata are Thorne Dreyer’s guests. Their topic: “Rebel Cities in the Era of Trump.” Early’s latest book is Refinery Town: Big Oil, Big Money, and the Remaking of an American City. The book describes the unusual electoral success of a multi-racial municipal reform movement in Richmond, California. Nick Licata, who served five terms as a progressive city councilor in Seattle, wrote Becoming a Citizen Activist: Stories, Strategies & Advice for Changing Our World. 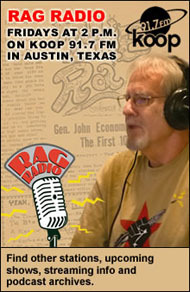 Rag Radio, a weekly hour-long syndicated radio program that has aired more than 300 original shows since September 2009, is produced and hosted by Rag Blog editor Thorne Dreyer. Tracey Schulz is engineer and co-producer. 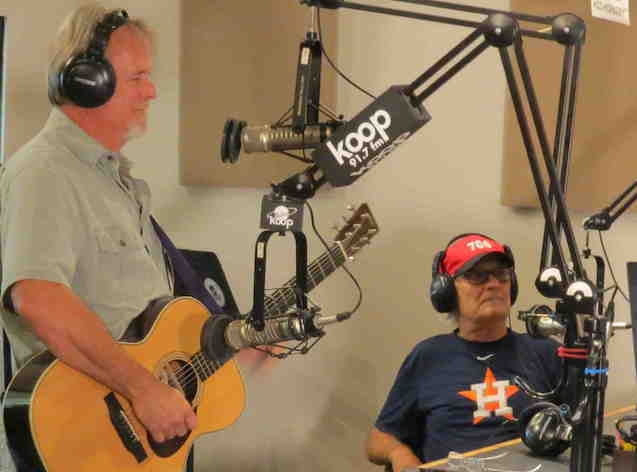 Rag Radio is produced in the studios of KOOP 91.7-FM, a cooperatively-run all-volunteer community radio station in Austin, Texas, and is first broadcast live on KOOP every Friday from 2-3 p.m. (CDT) and streamed live on the web. All Rag Radio shows are posted as podcasts at the Internet Archive. Rag Radio can also be heard on WFTE, 90.3-FM in Mt. Cobb, PA, and 105.7-FM in Scranton, PA., on KPFT-HD3 90.1, Pacifica radio in Houston, on KKRN 88.5-FM in Round Mountain, CA, and as a featured podcast at Veterans Today. Find details here. After broadcast, all Rag Radio shows are posted as podcasts at the Internet Archive. Rag Radio is produced in association with The Rag Blog, a progressive Internet newsmagazine, and the New Journalism Project, a Texas 501(c)(3) nonprofit corporation. Please contact us at ragradio@koop.org. This entry was posted in RagBlog and tagged Alan Pogue, Alice Embree, Bruce Melton, Glenn W. Smith, Gregg Barrios, Guy Forsyth, Interviews, Jim Hightower, Jonathan Lerner, Katya Sabaroff Taylor, Ken Burns, Kerry Awn, Maggie Rivas-Rodriguez, Nick Licata, Podcasts, Rag Radio, Steve Early, Terry DuBose, Thomas Cleaver, Thorne Dreyer, Tracey Schulz, Uranium Savages, Veterans for Peace. Bookmark the permalink.